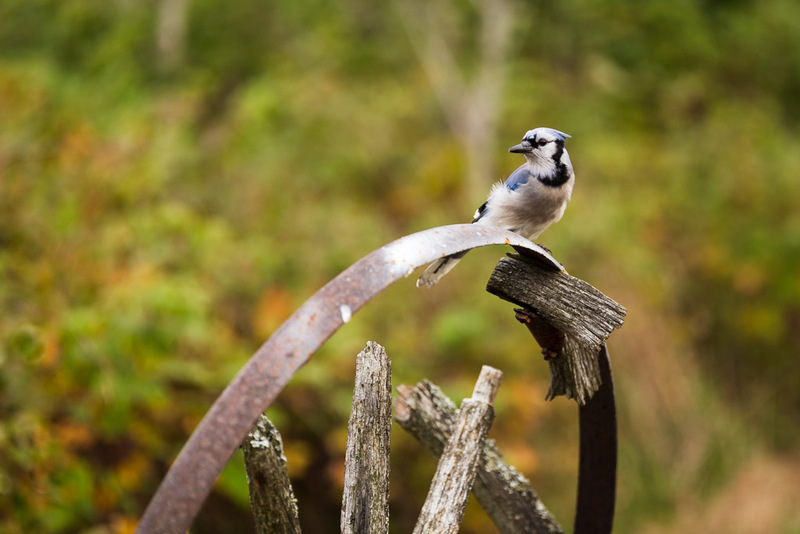 Some of you may recognize the title as a kind of chant for the Toronto baseball team, but we had a ton of fun with the blue jays at the cottage. It began when Heather put some bread on a fence post. When she saw that the jays were attracted, she moved it to the old wagon wheels. While I didn't get any photos from the post, I set up my camera on a tripod pointing towards the wagon wheels and retreated to fire remotely. I have previously posted the first photo, but I like it a lot, so I am posting it again as I think it belongs to this series. Of all the photos that I took, this one had the best light, caught by an interlude sunlight (in otherwise mostly cloudy conditions) from the setting sun. But I do have a few more from that general position. The ones with multiple birds are composites from more than one shot. 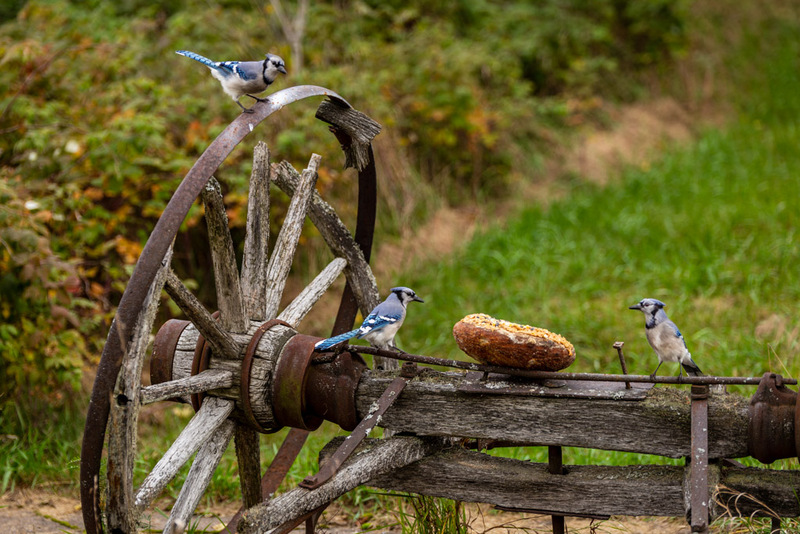 As much fun as I had doing the composites, I think the one of the solitary jay on top of the wagon wheel is my next favourite. 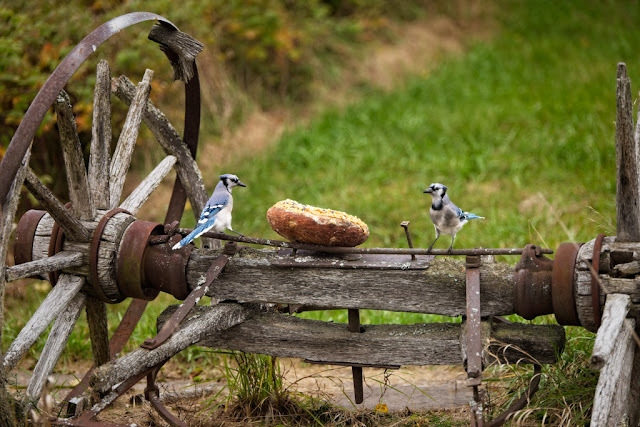 Inspired by this success, Heather went on to move the bread and create other feeder venues. 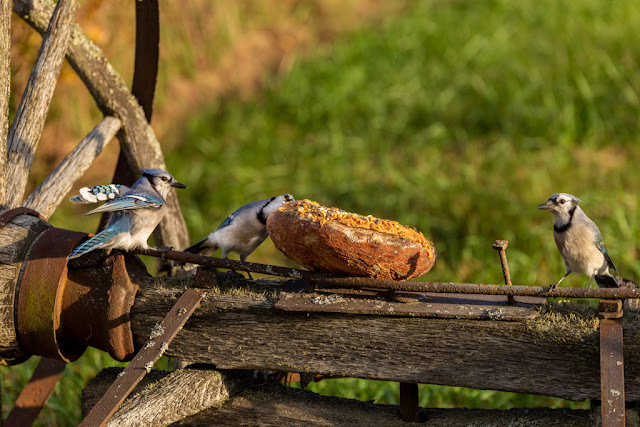 Blue jays are lots of fun to watch. Great photos! You got some great shots. They are clever birds. There are quite a few near here too. Sometimes they land on my deck railings looking for food but I don't put much out as I don't want to encourage the treerats. I'm smiling. Grinning at the birds, actually. They are fun birds to watch. The last one I saw was a bit over a week ago up at Pink Lake in the Gatineau Hills. The antics of blue jays are entertaining for sure. 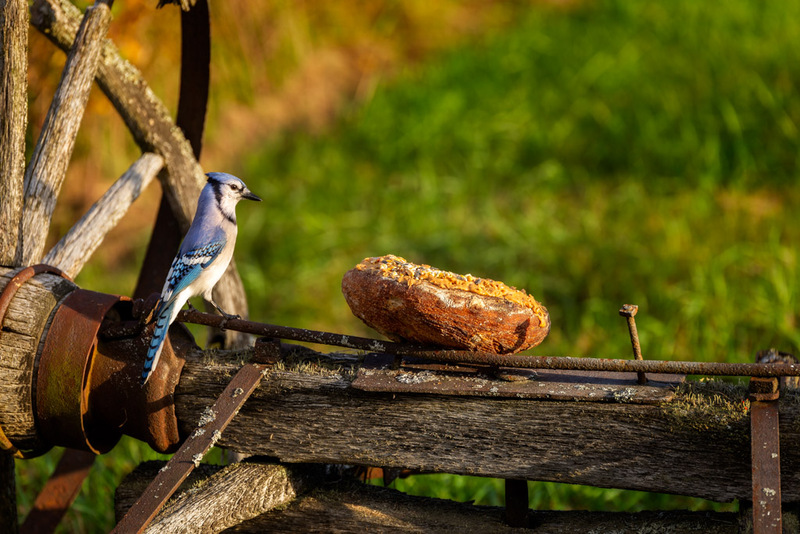 I liked the composites but concur that the single jay on the wagon wheel was a good one. I learned only recently that Blue Jays are Corvidae -- part of the Crow family. Smart and cheeky. These are a beautiful set of photos. Yes, the sun has been in and out!! !